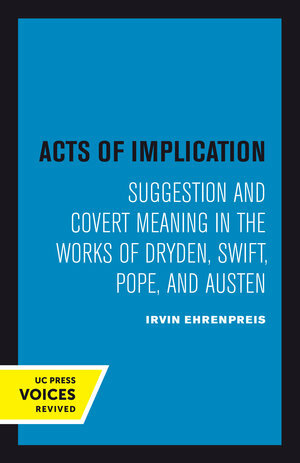 Acts of Implication argues that the best approach to the aesthetic value of much literature of the past is by way of the deliberate meaning—implicit or explicit—that the author invites the reader to share. Irvin Ehrenpreis shows that subtlety and indirection do not militate against the didacticism and lucid style we usually associate with writers in the Augustan tradition. In a group of simulating essays he examines how an eighteenth-century dramatist, an essayist, a poet, and a novelist imply meaning about politics, religion, and sexual passion, focusing on their concept of heroism to elaborate these themes. This title is part of UC Press's Voices Revived program, which commemorates University of California Press’s mission to seek out and cultivate the brightest minds and give them voice, reach, and impact. Drawing on a backlist dating to 1893, Voices Revived makes high-quality, peer-reviewed scholarship accessible once again using print-on-demand technology. This title was originally published in 1980. Irvin Ehrenpreis was the Linden Kent Memorial Professor of English at the University of Virginia. He is the author of Swift: The Man, His Works, and the Age and Literary Meaning and Augustan Values, as well as a contributor to the New York Review of Books and the Times Literary Supplement.